Despite the best efforts of the weather to photobomb the day, somehow Easter Compton managed to dodge the rain last weekend. 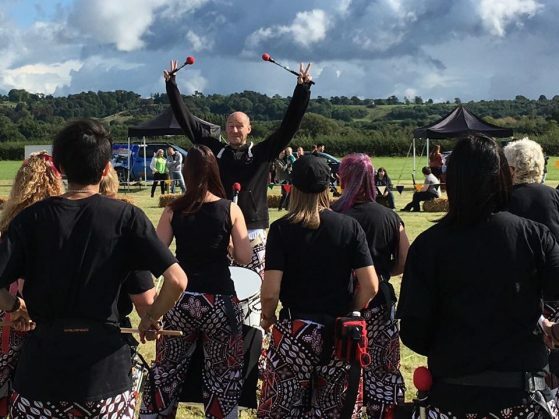 Which is good for Batala Bristol as our luck continues to hold this year with the weather. We’ve managed to finish the season without getting drenched. We might have to thank Gemmina for her prays to the gods to keep us drumming in the dry! Sometimes the last minute gigs like this weekend are the amazing fun to play at. So thank you to Yankee Candles for booking us to play at their corporate event and thank you to Francesca for pulling us together to be there. We would love to play at more of our lovely Bristol based companies events. So don’t forget to call us if you want to create a banging impact at your corporate, work or social events!